The Stearman Kaydet, also referred to as the Stearman Model 75, was perhaps one of the most employed and most recognizable trainer aircraft used by the US Armed Forces. The Kaydet was 8,500-unit strong—a number achieved just within roughly ten years of production. Design-wise, the Stearman PT-17 can be considered as an average biplane. It had the huge, fixed tailwheel undercarriage and an open cockpit that can hold two persons – the student and the instructor. A distinguishable trait of the Kaydet was that its uncowled radial engine. Powered by a 220hp Continental R-670-5 radial engine, the Stearman had two variants: the PT-17A, which was equipped with blind-flying instrumentation, and the PT-17B, which was equipped with agricultural spraying equipment. Both had a maximum speed of 135mph, a service ceiling of 13,200ft and a climb rate of 10,000ft at around 17.3 minutes. 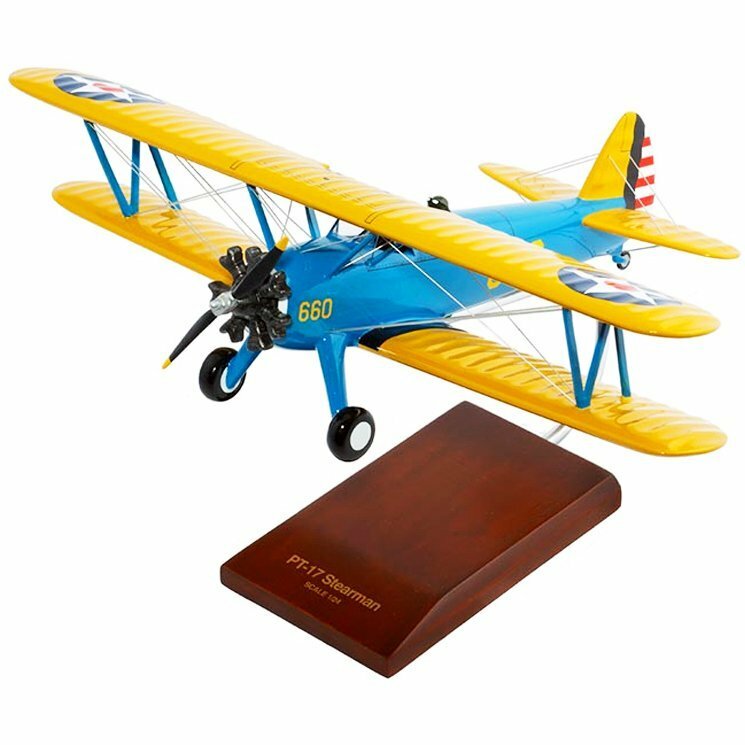 As a common sight in the skies, there is no reason why an enthusiast should fail to display a desktop model airplane of the Stearman Kaydet. Though not as grand as your black stealth jet, this trainer aircraft has made itself a recognizable face for avionics. A hand-carved work of art, this replica is fully hand-painted for accuracy.